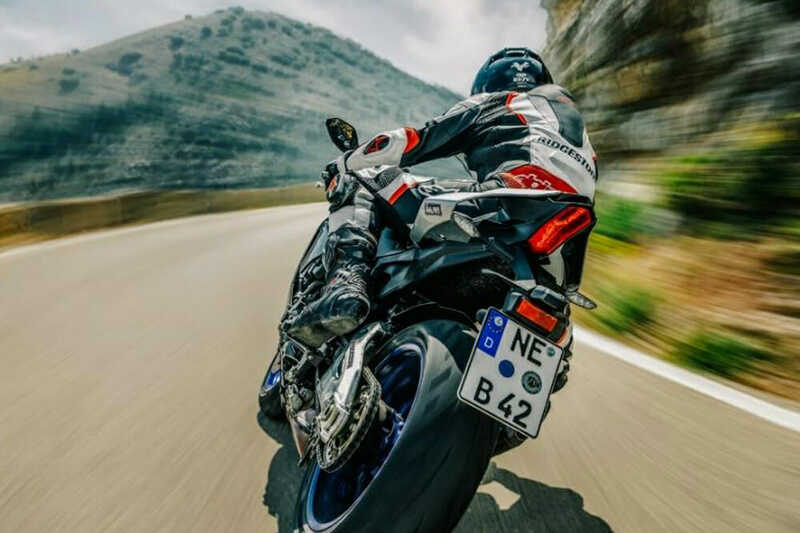 Tokyo (January 10, 2019) — Bridgestone Corporation announced the launch of the Battlax Hypersport S22, a new sports radial motorcycle tire for street use that will be part of its Battlax line of motorcycle tires. Battlax Hypersport S22 tires will be available in one front tire size and five rear tire sizes when released in the U.S. and Canada in January 2019 and in other regions in February 2019. The Battlax Hypersport S22 tire is the successor to the Battlax Hypersport S21 tire, which is featured as original equipment on numerous sports motorcycles and is a top replacement tire choice for countless riders. Compared to the Battlax Hypersport S21 tire, the Battlax Hypersport S22 tire boasts improved dry grip and lightness coupled with sufficient wet performance. These features provide sportbike riders peace of mind when the weather suddenly deteriorates or when riding on wet surfaces. 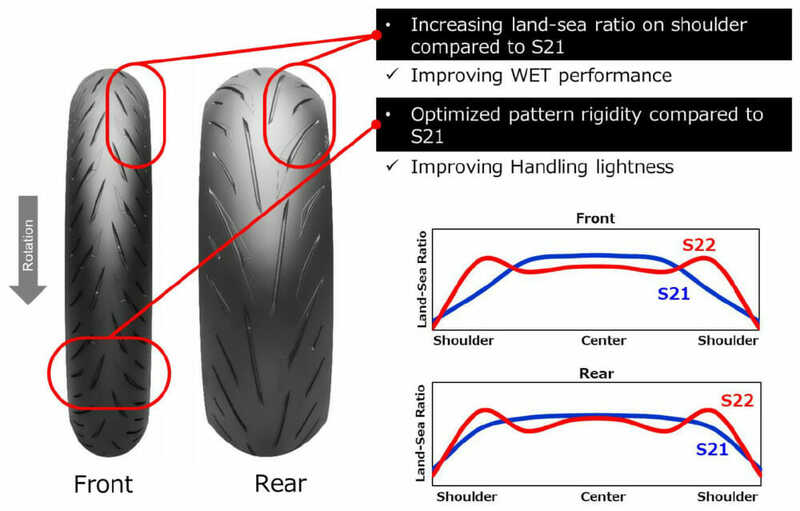 To enhance cornering on rainy days, the Battlax Hypersport S22 tire features an increased land-sea ratio on the tire’s shoulder in comparison to the Battlax Hypersport S21 tire, and pattern rigidity has been optimized. These features contribute to improved wet performance and handling lightness. In the development of the Battlax Hypersport S22 tire, Bridgestone employed its proprietary Ultimat Eye™ technology,*1 to measure and visualize the behavior of tire contact patches. This technology has also been used for developing tires for the FIM Endurance World Championship. Bridgestone has reduced the slippage area in the rear part of the tire’s contact patch in comparison to the Battlax Hypersport S21 tire. These changes contribute to improved grip and light handling of the Battlax Hypersport S22 tire while preventing declines in lifespan. *1. Ultimat Eye™ is Bridgestone’s proprietary tire development technology for measuring and visualizing the behavior of tire contact patches. 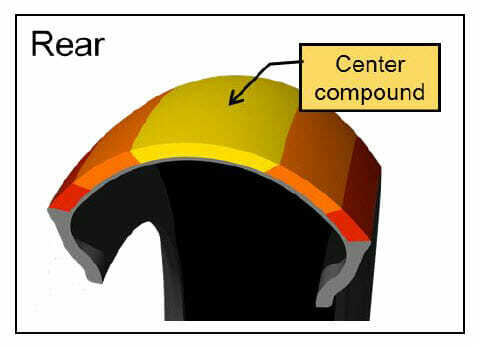 Conventional tire development consists of running simulations, building prototypes, and using laboratory measurements, as well as actual vehicle tests to verify performance. Ultimat Eye™, meanwhile, makes it possible to reproduce high-speed riding conditions that are equivalent to those of an actual vehicle in the laboratory, enabling tire contact patch behavior to be visualized. Together with conventional vehicle tests, this technology can contribute to improved tire performance through high-precision analyses and performance verification with a solid scientific basis.